She knew for a long time that this is where she belonged. When she was a little girl, Rocio Diaz moved with her family to Goshen. “It was not like Mexico,” she says with a smile. “There was a pool at the school and a cafeteria and so much different.” Indiana also had harsh winters and that was something Rocio’s mother didn’t like. The Diaz family moved south. Delia says she “always wanted to come back.” Fifteen years ago, she did and she has no intent to leave. 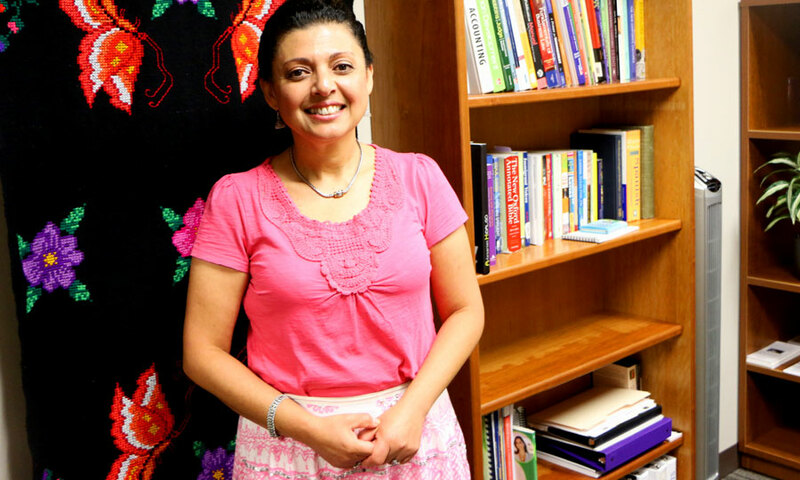 Rocio has several responsibilities at Goshen College where she is employed. Among them, she serves as an Associate Director of Student Life, is involved with the English as a New language program and is the advisor for the Latino Student Union. She strives to help those who may not understand what being a college student involves. This is true for both those who attend Goshen College and their families. Rocio believes in a life of learning. The school offered a program to help its employees earn a degree. Rocio took advantage, even though she knew it would take her a long time to graduate. She plugged away and earned her degree in six years. Consistent with her desire to keep developing her talents, Rocio recently learned to make a pie. It would not be the least bit surprising to see her using the fruits from her garden when baking next summer. Her abundant garden has blueberries and grapes along with other fruits and vegetables. Of course, there are tomatoes and peppers. “I need to have fresh salsa,” she says. That sounds good to us.